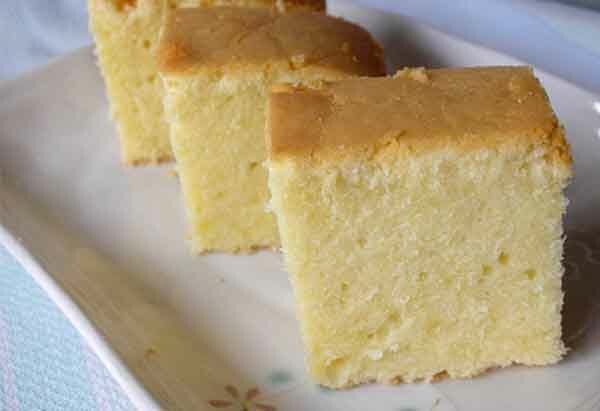 HOW TO MAKE EGGLESS SPONGE CAKE ? Sieve maida twice in a bowl. Add baking soda and baking powder and mix it well. Take one more and add clarified butter to it. Add crushed sugar and beat it well. Add condensed milk and beat it. Add milk and mix it. Add maida mixture and mix it well. Avoid lumps. Beat until batter becomes smooth. Take a microwavable container and grease it with clarified butter. Preheat oven on convection mode at 180 degree. Place the microwavable container in oven for 25-30 minutes. Bring the container out and let the cake cool. You can poke a tooth pick at the center to check if it’s done. If the toothpick comes out clean with no batter stuck to it that means our cake is ready. Preparation : Get everything ready like preheat of oven, greased container, crushed sugar and sieved maida before preparing the cake. Sieve maida twice. Prepare mixture : Take a large bowl and add 200gm sieved maida to it. Now add 1tsp baking powder to rise the cake as it minimizes the escape of the gas from the batter and 3/4tsp baking soda. Mix it well or you can sieve this mixture so that every ingredient mix very well. Keep it aside. Keep all the dry ingredients in one bowl and liquid ingredients in another. How to make batter : Take a large bowl and add 1/2 cup of clarified butter(room temperature). Add 1/2 cup crusted sugar(you can also adjust it according to your taste but don’t add it to much as it affects the sponginess of cake). Beat it well and then add 1 cup condensed milk. Beat it well using whisk. You can make condensed milk at home as well. It acts as an egg and gives a unique sweetness and made the loaf dense and moist. Here I am using readymade amul milkmaid/condensed milk so I can save my time. Now add maida in small quantity and beat it nicely and add milk. The batter will foam up. Now add rest of the maida and milk and beat until batter becomes smooth. Remember, don’t beat the batter for too long as it will allowed the bubbles to escape. How to bake : Take a microwavable container and grease it with oil or clarified butter. Always use a container which is above than the batter. Tap the pan on table to remove the air bubbles and settle down the batter. Preheat the microwave at 180 degree on convection mode. Now place the microwavable container in microwave for 25-30 minutes. But this is on my microwave basis, you can set the time according to your microwave. Now just sit back on the chair and wait but don’t forget to check it after short intervals. When done, poke a tooth pick at the center to check if it’s done. If the toothpick comes out clean with no batter stuck to it that means our cake is ready. Now let it cool and after that take cake out from the container and slice it. If you want you can garnish it with white sugar or brown sugar otherwise leave it as it is not necessary. And now serve this deliciously fluffy EGGLESS SPONGE CAKE to your family and cherish the occasion. You can add dry fruits if you want. Do not make thin or thick batter it will affect the sponginess of cake. You can prepare condensed milk at home as well. If you want, add vanilla essence. But always prefer black colored vanilla essence as the flavour is comparatively good than white one. Use toothpick to check if cake is ready or not. You can also use curd instead of using milk and condensed milk. But use curd at room temperature. Don’t prepare batter too early it can ruin your cake. Make sure that all the ingredients that you are going to use must be at room temperature. Add tutti frutti if you are making cake for kid’s or for their birthday parties.